Various nameless faces grinned at one another and after a few seconds some began to clap; soon most of the platform joined in. I often take out my notebook and record what James says. He always open with: “Hello my name is James. I just want to say how lovely it is to see you all here today”. 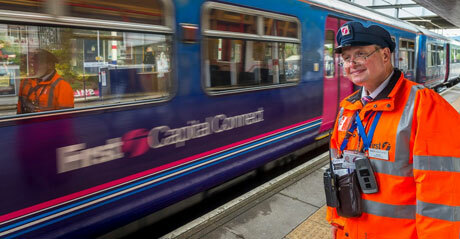 Sometimes he goes on to say: “I am terribly sorry to announce the next train is running a minute late. It jolly well matters and I’m not going to be complacent about it”. Other times, he will say: “I tell you this today because I care. You are all very important to me”. After these announcements he often gets a round of applause and many thank him for brightening their day. In person, he is endearing and effortlessly charming. His face is round and clean-shaven and he has a gentle smile. His hair is short and mousy coloured, with a grey patch on the left side, and when he works he wears a train driver’s hat. At the end of his nose hang a pair of small round frame glasses, which allow his watchful, green eyes to peer over. James was born in Reading in 1961, the son of a distinguished Geology professor. He believes that being a gentleman is about being kind to people. This is what he strives for on a daily basis in his job. Before becoming a station announcer, James worked as a butler for a Private Members Club in Inverness, Scotland. It was here that he honed his sense of gentlemanly service. He worked as butler for fifteen years but left when new management came in. “They wanted to do things their own way,” he says. “I failed to change. I wanted to stay with the old. 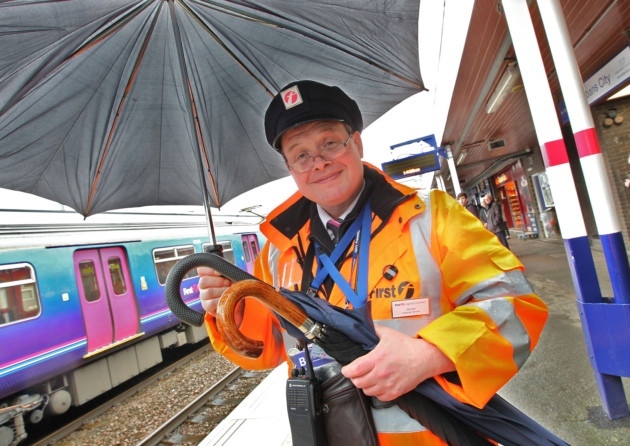 It is a very classic conundrum.” Afterwards, James looked after people with learning difficulties for three years, before joining First Capital connect as a station announcer and train dispatcher 14 months ago. However, there was a period when being kind and noble wasn’t so easy for James. “I can assure you I am a profound failure in life,” he says softly. “I spent much of my life as an alcoholic. But I haven’t had a drink for 15 years. The hard knocks have taught me that you have to strive to lead a good life. I can’t emphasise that enough. It’s so important. My life is meaningless if I am not being nice to the people around me. Now I am well aware that human nature is thoroughly flawed. Mine in particular. But that’s not the point; the point is I have to be happy being me. When discussing alcohol addiction, James becomes reflective, even philosophical. “I drank because of life experience,” he says. “We do try and learn, don’t we? But we all learn very badly and slowly. And most of us probably don’t learn that much, but we do try.” Evoking Socrates, he adds: “Real wisdom is knowing that we don’t know anything. “Life teaches us a sort of wisdom, if we are willing to listen. Most of the time we are not willing, really. I mean we look at the people around us and think they have settled lives and they look calm and wise. But inside people are always different. Next Post: Triple Threat . . .
What a great post about a man with a delightful attitude. May he live long and conquer many frowns with his smiles and kindness. People like James restores my faith in humanity. I am so impressed with his sincerity and generous spirit. I love George Bernard Shaw’s quote, as well. It takes so little effort to share warmth with strangers, but so few do it. If we could pay James warmth forward….